The Global TB Drug Facility (GDF), launched in 2001, is a new initiative designed to increase access to essential high-quality TB drugs, and rapidly accelerate progress in the DOTS expansion to reach the global TB control targets by the year 2005. It was developed by the Stop TB Partnership as a "virtual" organization, to rapidly and efficiently provide grants in kind of essential TB drugs to countries in need. It has received grants from the Canadian International Development Agency and others, and so far has approved applications from more than 20 countries, enabling the treatment of over one million patients. The Global Fund to Fight AIDS, TB & Malaria (GFATM) is another newly created international program proposed in 2001 by Kofi Anan, the UN Secretary General. Major developed countries and private donors have pledged $1.6 billion for the coming five years. It is intended to attract, manage and disburse additional resources through a new public-private partnership that will make a sustainable and significant contribution to reduce the impact of HIV/AIDS, TB and malaria in countries in need. It will also contribute to the reduction of poverty as part of the Millennium Development goals. It has already committed a total of $616 million, 23% of which goes to 16 countries for TB. It is indeed encouraging for us to see how the political and popular concerns over the tuberculosis problem have greatly increased and that such mechanisms to provide material resources to the needy states have been established internationally. We could even state that the landscape of tuberculosis control in terms of material resources has changed drastically. Until recently, the most common headache of NTP managers has been the lack of drugs, or lack of budgeted funds to purchase them. The GDF may be a good medicine to relieve this headache if your program implements DOTS properly. The impact of GFATM may be more tremendous, because it involves not only necessary drugs, but all the material aspects of NTP to be purchased with the grant. I happened to work closely with these two programs, and have had the opportunity to observe their results and discuss the possible consequences of their implementation. Needless to say, they are not the panacea. It is now becoming clearer than ever that the material resources alone are not what really matters. Rather, they could cause problems, such as drug resistant tuberculosis and even moral corruption. These resources should be granted solely to such recipients whose programs can be benefited only through them. In terms of DOTS program package, drugs can solve only one element out of five. If we assume the government is committed heavily enough to make a proposal to GDF, what about the remaining three elements, i.e., case finding, case-management, and monitoring? It is my impression that only a small number of the applying countries are really entitled in this meaning. It is good for GDF to have some technical component such as assistance in drug procurement, but this element alone may not be enough for them to use the drugs properly as a whole. Obviously, GFATM is very weak on this point. Ideally a part of the GFATM grant should be spent to enhance or even to "buy" the technology. I do hope this point will be realized. This aspect needs very careful and rigorous consideration. With all the possibilities of solving the problems of material resources for the DOTS expansion, we should be more aware of the relevance of sound technology. We should insure that human resources have adequate knowledge and skills necessary for the planning, implementation and evaluation of the NTP in your own setting. In this meaning, it is my sincere wish that our international training course, with its forty year history, could contribute to the human resource cultivation in your NTP in the future. Out of sight, out of mind" the saying goes but not life at RIT. Beginning with our period of Japanese language study at HITC-Hachioji City, life in Japan was pleasant. The field trips opened our eyes to the exciting scenario Japan offers. The academic and practical sessions proved to us that much was needed in the arena of TB control. It soon became clear that smear microscopy reading and assessment of quality control to improve TB diagnosis in the implementation of DOTS was important. Special thanks to Mori-san and his wife for keeping us warm at the dormitory, as well as to our lecturers for preparing us to become trainers within our various countries (Zambia, Yemen, Myanmar, Philippines, Cambodia, Bhutan, Papua New Guinea and Mexico.) Lastly, my regards to our hospitable JICA-coordinators, who made our course comfortable and ensured that every item of the programme was successful. We, the ex-participants of RIT courses are happy to greet you via your newsletter from distant Mongolia and to take the opportunity to tell you our story. Laboratory services are the core element of the modern TB control programme in detecting infectious source cases in the community and in monitoring patient response to chemotherapy. The National Tuberculosis Programme of Mongolia in effect since 1994 now operates a nationwide TB laboratory network consisting of 31 laboratories. All the above-mentioned achievements are directly linked through the close cooperation of the National Centre for Communicable Diseases (NCCD) of Mongolia with the Research Institute of Tuberculosis (RIT) of Japan, as well as through the contributions of the long-term specialized courses offered by RIT. Since 1992, over 10 professionals have been enrolled in different RIT training programmes and today all of them are working in their fields of specialization. 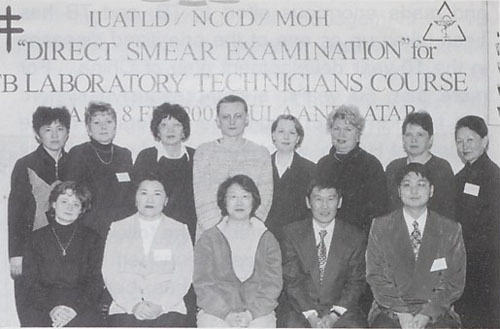 Together with our colleagues, we have been able to establish a nationwide quality control system for smear examination. Presently, the Quality Control System of Mongolia is operating regularly and smoothly, and the existing 31 microscopy centers are participating actively in quality control activities. NCCD has been appointed as a collaboration center of IUATLD since the year 2000. As an outcome of this, NCCD conducted an international training short-term course in the Russian language on AFB microscopy for Russian medical personnel: medical doctors and technicians under the sponsorship of the IUATLD. The course was mainly run by previous RIT course participants and it was warmly appreciated by all participants from the Russian Federation. We believe we were able to contribute to participants' skills in AFB microscopy technique and to enrich their knowledge of the modern concept of TB control programme using DOTS strategy. It is impossible here not to mention the contribution of laboratory training course director A. Fujiki for helping to make our programme a success. Taking the opportunity, we would also like to express our deepest gratitude to our professors for their whole-hearted support, assistance and contributions. We wish you all the best and great successes in your noble deeds! 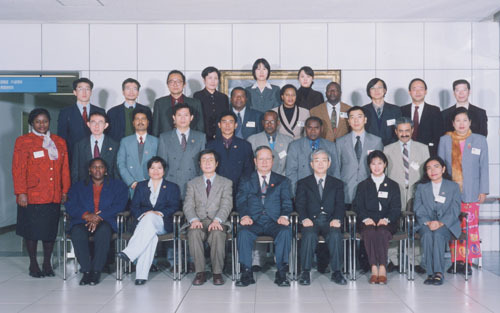 The Group Training Course for Leadership Training for TB Programme Management is a newly modified course of TB programme management and was held on 22 January - 1 February 2002. The course is geared for National TB Coodinators and directors of other programmes such as primary health care and planning divisions at national levels and for director generals. In order to invite these busier executive directors from national levels, the duration of the course was shortened from 6 weeks to 2 weeks. Curricula for the first week focused on workshops covering current topics such as urban TB, TB/HIV co-infection, and health sector reform. After visiting Kyoto to observe activities of the Anti-TB Women's Society and its volunteers, topics such as planning and management, logistics, and human resource development were discussed the 2nd week. As all partcipants were well experienced in many aspects of TB programme implementation, each session benefited from lively discussion. This course will be held every 3 years so that a sufficient number of national TB coordinatiors may be gathered. To make use of a golden opportunity, we requested national TB programme managers that participated in the course to contribute to this special edition as follows. The high prevalence of tuberculosis has been one of the most serious issues in China. There are nearly half a million new cases occurring each year, leading to 130,000 to 150,000 deaths in the whole country. With economic growth as well as improvement in people's lives, the problem is becoming increasingly obvious. Tuberculosis is one of the notifiable diseases in the Law of the People's Republic of China on the Treatment and Control of Infectious Diseases. The central government has paid great attention and made enormous effort to TB, and TB has been taken up as one of the prioritized diseases in the 10-year development plan of China. For more than 50 years, a comprehensive system has been in effect under the leadership of the Ministry of Health, which has played a significant role in the control of TB. Particularly since 1992, under the support from the World Bank/WHO and then the central government in the following year, DOTS strategy has been launched in most provinces. Assorted policy has been made geographically based on local economic situations, prioritizing less developed areas. The local governments in the provinces made great input in the activities. As a result, 64% of population is now covered by DOTS strategy, millions of patients are able to get treatment, and more than 90% of them have been cured so that prevalence rate decreased more than by 30% in some provinces. At the same time, China's effort in the control of TB has received recognition and expressions of support from international parties such as WHO, Damien Fund, DFID and JICA. These groups have provided technical and financial support to China. However, the control of TB in China is still a challenge. First, with its vast landscape, unbalanced economic situation and the largest population in the world, resources are not sufficient to meet the demand. Even though China contributed a lot and received a lot of support from international society, sustainability is a big problem. Second, due to its economic development, a floating population is a serious problem in the control of TB and DOTS strategy becomes harder to implement and supervise. This could be a potential risk for TB spread in a wider range. Third, in recent several years, HIV/AIDS has been becoming more serious. Dual infection and fatality should be taken into consideration. The control of both HIV/AIDS and TB is essential and crucial to each other. In addition, the issue of drug resistance becomes more and more important. The emerging of drug resistance could be a barrier in the control of TB in China, as it is worldwide. The control of TB is not only important to people's health, but also to the political and social stability of a nation. Currently, the government is struggling against TB as well as HIV/AIDS. The fight against these diseases is a part of the global effort to protect human beings and it would definitely contribute to the whole world. The success of this course was based upon achieving a lot in a small time frame. The quality and the depth of the subject lectures presented were highly scientific and philosophical. Lecturers had a lot of knowledge and experience. So much efforts and research had been put into the subject materials that made this course a milestone in the battle against TB. Despite the short duration and the compact nature of the course, the quality of performance by the participants was of very high quality. The nature and significance of the course stimulated participants to work harder in order to equip themselves to tackle the problems of TB and HIV/AIDS head on. The challenges for each participant are enormous and may prove difficult, but we have been shown how to systematically tackle each problem one by one through methodology highlighted in the lectures, discussions and through experience. Technical knowledge and managerial skills are the essential tools to combat the worldwide scourge of TB and HIV/AIDS. These were the areas that this course addressed. Each participant brought home a wealth of knowledge gained from this course, which they will work to apply or incorporate into the anti-TB programs of their respective countries. Since 1990, the Government of Peru has made the political and financial commitment necessary to guarantee TB Control as a national priority. During the past decade, great emphasis has been placed on providing patient treatment at local health facilities, improving local laboratories and developing human resources as a means of improving access to services. The development of TB control in Peru has taken place in the context of a sector-wide approach with the highest level of political commitment. TB services are seen as an integral part of the government's social programme against poverty. The high-quality of its management system has provided TB services with efficient disease control and has stimulated other parts of the health system to be equally effective. Peru has reached and surpassed global target of a 85% cure rate and 70% case detection rate in less than ten years. Through effective TB services using DOTS strategy, we are now dealing with potential new threats such as MDR-TB and HIV/AIDS-TB. As a result of its intense and sustained efforts in DOTS implementation, the country is experiencing a yearly 5% reduction in incidence of TB. Effective management characterizes Peru's success. This management system now maintains the essential core of TB control functions that guarantee quality. Stability and strong leadership in the management for TB control at central, regional, and district levels have ensured efficient training of multidisciplinary health teams throughout the country, strong supervision, free TB diagnosis and treatment in each one of the 6,530 health centers of the Ministry of Health, and regular procurement and distribution of TB drugs and laboratory supplies. The National TB Control programme implemented a standard ambulatory regimen for MDR-TB cases on a national level in 1997. This has met with the encouraging result of 70% cure rate. Now, with support from PIH/SES, funds are available for DOTS -Plus. - guarantee program sustainability for at least two decades to maintain epidemiological impact on TB transmission. - develop vigorous intervention strategies for high risk groups and zones (TB "hot spots"). - monitor the impact of the HIV/AIDS-TB association. - continue to strengthen DOTS-Plus strategy for MDR-TB patients. Effective government leadership is a hallmark in Peru's success at combining international partnerships with effective national political commitment. The government of Peru is part of the Partners Coalition (WHO, CDC, PIH, and NTP Peru) formed to address MDR-TB in Peru and to create a model that could be used in other countries. In the Philippines, DOTS strategy was begun in 1996 with 3 chosen areas for pilot study. This was systematically expanded to its current coverage of about 98% of the total population with the assistance of international agencies. This achievement was based on hard work in basic Programme elements. First, site preparation was undertaken through advocating with Local Officials, soliciting their commitment in the form of memorandums of agreement, issuances and resolutions. Capacity building of all implementers, including community volunteers, was undertaken to equip them in the technical & managerial concepts of NTP operations. This was introduced at every level through the involvement of medical & paramedical health workers. This technical back-up, along with the commitment of NTP Coordinators was a considerable factor for the success of DOTS. National and local governments showed political support for this endeavor by providing drug assistance through counterpart sharing of drug needs. Monitoring & evaluation activities were likewise installed to oversee the progress of implementation and identify weak points for improvement. These basic steps were carried out at every area wherein DOTS strategy was introduced. Additionally, at every site, the support of international partners was vital in helping introduce and adopt the DOTS strategy. Having a population of 77 million, NTP was successful in covering the country using DOTS strategy. As the expansion phase progressed, initiatives were incorporated to address the issues & concerns identified. Active participation in advocacy activities through a formulated communication plan was implemented in 1999. Initially dubbed as the "TB Alert," this aimed at increasing public awareness in the quality of service offered by the periphery. It coincided with National TB Month (held every August) and various key messages were promoted to strengthen public awareness of DOTS strategy. Support groups were coalesced to form PhilCAT (Philippine Coalition Against TB), where a strong interaction among members could be expressed. This included the government health agency, other government bodies, private sector, academe and non-government agencies. Their interaction will be highlighted every World TB Day through various promotional activities. A high-level committee, known as P.A.C.T. (Project Assistance to Control TB), proved a positive factor in the Programme. Being composed of various local and international stakeholders, this body tackled issues of policies, technicalities and management. Decisions were made through consensus building and transparency among the members was evident. Likewise, the committee offered an avenue for discussing and sharing ideas/concerns that facilitated decision-making. At present, the Programme is embarking on other initiatives that will allow us to reach our targets and maintain quality DOTS implementation. DOTS for special groups, such as the indigenous community and children, is now on-going as part of operational researches. Expansion of the strategy to hospitals and with the private sector is also underway. The latter is in collaboration with PhilCAT, which considers the public-private mix in different scenarios. Maintaining quality control of microscopy services is established through a network of other laboratory facilities, spearheaded by the National TB Reference Laboratory and by the Cebu Regional Reference Laboratory. The TB situation in most countries has undergone remarkable changes. What appeared to be a "White Plague" upon mankind is no longer viewed as an enigma. However, the challenges ahead still seem unending and only by maintaining our focus and pushing forward will we one day find that we won the battle. TB is now a serious cause of death in Thailand, especially among the HIV/AIDS patients. The Thai Ministry of Public Health has already prioritized TB control. The Thai National TB Control Programme focuses on improving the integrated health service system, especially through providing standardized TB diagnosis and treatment to cover all districts. The data of WHO, reported 86,000 new TB cases in 1999, equivalent to 141 per 100,000 inhabitants, and 10% of new TB cases with HIV co-infection. Additionally, multi-drug-resistant TB without previous treatment was 2.1%. As of August 2001, 82.3% of the districts have implemented DOTS strategy as compared to 2000 of 73.3%. It is reported that 85-90% expansion could be achieved by December 2001, although it will not reach 100% targets originally planned 5 years ago. High political commitment resulted in a preservation of government resources for TB even despite the severe economic crisis experienced after 1997. A new five-year DOTS expansion plan for 2002-2006 has been developed and is included in the Health Care Reform Acts. Full DOTS coverage is to be recorded by the year 2002 and TB services will be integrated in all health facilities. Actions are also focused on special groups such as the homeless and marginalized populations. DOTS expansion in large urban areas remains a priority. The private sector in large cities strongly influences public opinion and treatment practices. A newly developed urban TB control project in Bangkok will collaborate with private hospitals and private practitioners through innovative approaches for TB Control, such as provision of TB drugs, reporting and recording for use by the TB programme. Major constraints to sustain effective TB programme include the constantly rising number of TB cases attributing to the HIV/AIDS epidemic and the burden of a potential multi-drug-resistant tuberculosis epidemic in areas with high HIV/AIDS burden. Additional financial resources are to necessary for areas where DOTS strategy has been carried out recently. Operational research on TB preventive therapy has been implemented in selected areas of Thailand. This briefly summarized the achievements and challenges of our TB control programme. "Join us in the 40th Anniversary of the RIT courses!" Forty years have passed since the first RIT training course started in 1963. 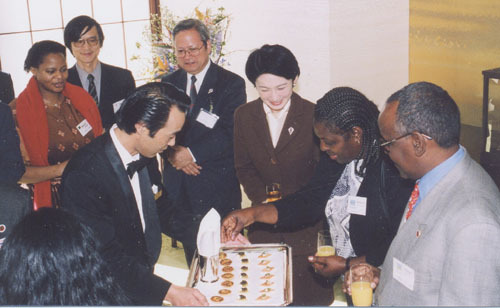 We are planning to organize the 40th Anniversary Event in Tokyo early 2003. The newsletter next year will also have a special focus on the history of the course. In this connection we would like to receive articles and comments from the alumni members. Your input would be of great value in evaluating the current RIT courses and improving the future courses. Also we wish to update your contact address (preferably your e-mail address as well), and the current position in your country. So, do not forget to write to us in this special occation! After working at the Research Institute of Tuberculosis for 6 years, I have now started a new job as TB Coordinator in Osaka City. When I reflect upon my work at RIT, these six years has been one of the most fruitful periods of my career. 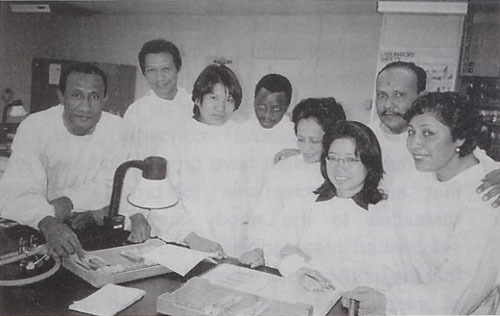 My main responsibilities at RIT were JICA projects in Yemen and Nepal, research activities in Cebu, Philippines, research activities in Chiang Rai and Nakhonsawan, Thailand, and international training courses on TB and HIV. I felt that it has been a great opportunity for me to work at RIT because RIT staff members are able to be involved in multi-facet international cooperation activities. When there was no training course running, I visited different countries to oversee projects and research activities nearly each month. These experiences were intertwined and benefited one another. To prepare useful training courses, we must develop curricula adapted to the actual TB programme needs of each country. As we gain more direct experiences in planning, supervision, monitoring, and evaluation, we are able to deal with crucial points for programme implementation within our training courses. Every encounter with health workers at community, district, province and national levels gave me precious experiences that provided increased insight on how to solve TB problems. When participants, course directors and facilitators can communicate in detail on important technical matters, a course becomes more lively and fruitful. What I most enjoyed is engagement in exercise for Project Cycle Management and facilitating preparation of action plans. In addition, it was also a learning experience to hold discussion with lecturers and participants. I particularly appreciated contributions made by participants from Peru, which has a good DOTS programme, as well as from Thailand, which has the best programme for HIV control. Regarding my new work, TB incidence is now at 85 per 100,000 in Osaka City, the highest in Japan. Our given goal is to reduce the incidence rate by one-half within the next 10 years. Our plan is to implement DOTS beginning with homeless patients to reduce TB transmission in community. This will be a challenging work for me. I look forward to seeing you at any international meetings in future. Thank you and best wishes. 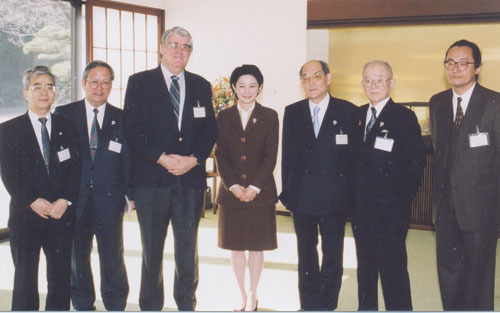 Dr. Shimouchi was previous Head of International Cooperation Department until March '02, and Dr. Ishikawa, Vice Director, holds the concurrent post as Head, and Dr. Suchi is promoted as Deputy Head.